Corsican immigration to Puerto Rico came about as a result of various economic and political changes in mid-19th century Europe; among those factors were the social-economic changes which came about in Europe as a result of the Second Industrial Revolution, political discontent and widespread crop failure due to long periods of drought, and crop diseases. Another influential factor was that Spain had lost most of its possessions in the so-called "New World" and feared the possibility of a rebellion in its last two Caribbean possessions—Puerto Rico and Cuba. As a consequence the Spanish Crown had issued the Royal Decree of Graces of 1815 (Real Cédula de Gracias) which fostered and encouraged the immigration of European Catholics that were not of Spanish origin to its Caribbean colonies. The situation and opportunities offered, plus the fact that the geographies of the islands are similar, were ideal for the immigration of hundreds of families from Corsica to Puerto Rico. Corsicans and those of Corsican descent have played an instrumental role in the development of the economy of the island, especially in the coffee industry. Juan Fantauzzi was the first documented Corsican to immigrate to Puerto Rico. He was born about 1734 in Morsiglia, Corsica. He immigrated to what is now Aguadilla in the 1760s. He married Josefa Martínez. Two known children of his are Francisco and Juan María Fantauzzi. He died November 5, 1798. It is his death certificate that confirms his Corsican origin. Corsica is an island located west of Italy and southeast of France. Corsica belonged to the Republic of Genoa (before Genoa became part of Italy) and in 1768 was ceded to France to pay off debt. The island relied largely on its agricultural economy for survival. Certain changes occurred in Europe during the end of the 18th century and beginning of the 19th century that would greatly affect the lives of the French and the people of Corsica. One of those changes came about with the advent of the Second Industrial Revolution. With the Second Industrial Revolution, many of the people who worked in agriculture began to move to the larger cities with hopes of finding better jobs and better lives. Also, there was a widespread crop failure due to long periods of drought and crop diseases (e.g., the Phylloxera epidemic destroyed the Corsican wine industry), a cholera epidemic and a general deterioration of economic conditions. Thus, many of the farms in Corsica began to fail. There was also widespread political discontent characterized by bitter armed conflict. King Louis-Philippe of France was overthrown in the Revolution of 1848 and a republic was declared with a Provisional Government. Three new political groups emerged during that era: they were the liberals, radicals and the socialists. The combination of man-made and natural disasters in Corsica created an acute feeling of hopelessness. All this came about at a time when Spain was growing fearful of the possibility of a rebellion in her Caribbean possessions, which consisted of Puerto Rico and Cuba. By 1825, Spain had lost the entirety of her territories in South America and Central America and sought measures to prevent a repetition of this in the Caribbean. It was decided that an influx of Catholic immigrants from Ireland, Corsica and Italy would provide a loyal base for the Crown and appeals were made to encourage immigration. 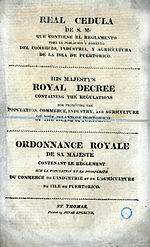 In 1815, the Spanish Crown had issued the Royal Decree of Graces (Real Cédula de Gracias) which fostered the immigration of European Catholics that were not of Spanish origin to its Caribbean colonies. The island of Puerto Rico is very similar in geography to the island of Corsica and therefore appealed to the many Corsicans who wanted to start a new life. Under the Spanish Royal Decree of Graces, the Corsicans and other immigrants were granted land and initially given a "Letter of Domicile" after swearing loyalty to the Spanish Crown and allegiance to the Catholic Church. After five years they could request a "Letter of Naturalization" that would make them Spanish subjects. Hundreds of Corsicans and their families immigrated to Puerto Rico from as early as 1830, and their numbers peaked in the early 1900s. The first Spanish settlers settled and owned the land in the coastal areas; the Corsicans tended to settle the mountainous southwestern region of the island, primarily in the towns of Adjuntas, Lares, Utuado, Ponce, Coamo, Yauco, Guayanilla, and Guánica. However, it was Yauco whose rich agricultural area attracted the majority of the Corsican settlers. The three main crops in Yauco were coffee, sugar cane and tobacco. The new settlers dedicated themselves to the cultivation of these crops and within a short period of time some were even able to own and operate their own grocery stores. However, it was with the cultivation of the coffee bean that they would make their fortunes. Cultivation of coffee in Yauco originally began in the Rancheras and Diego Hernández sectors and later extended to the Aguas Blancas, Frailes and Rubias sectors. By the 1860s the Corsican settlers were the leaders of the coffee industry in Puerto Rico and seven out of ten coffee plantations were owned by Corsicans. The Mariani family of Yauco decided on two courses of action which would strengthen their position in the coffee industry. First, a cotton gin was converted into a machine which was used in dehusking coffee cherries. Second, they sent two of their own as representatives to visit the important European coffee buying centers. The visit to Europe was a success and thus Puerto Rico became an important member of the worldwide coffee industry. The descendants of the Corsican settlers were also to become influential in the fields of education, literature, journalism and politics. Historian Colonel Héctor A. Negroni, (USAF-Retired), researched the Corsican-Puerto Rican connection and has provided with his work a wealth of information about Puerto Rico's ties with Corsica. Today the town of Yauco is known as both the "Corsican Town" and "The Coffee Town". There's a memorial in Yauco with the inscription, "To the memory of our citizens of Corsican origin, France, who in the 19th Century became rooted in our village, who have enriched our culture with their traditions and helped our progress with their dedicated work – the municipality of Yauco pays them homage." The Corsican element of Puerto Rico is very much in evidence, Corsican surnames such as Paoli, Negroni and Fraticelli are common. Several properties in Yauco and Ponce, which once belonged to the Corsicans who settled in Puerto Rico, are registered in the National Register of Historic Places in Puerto Rico. The Casa Franceschi Antongiorgi (Franceschi Antongiorgi House) was built in 1907 by the French architect André Troublard for Alejandro Franceschi Antongiorgi, a rich landowner and lover of the arts who frequently held banquets, concerts and meetings with visiting artists in his house. The Casa Antonio Mattei Lluberas, also called La Casona Césari (Césari House) was built in 1893 by Antonio Mattei Lluberas. This house is also known as "The House with Twelve Doors." Later, it was acquired by Ángel Césari Poggi, husband of Ángela Antongiorgi Rodríguez. The Césari Antongiorgi family was instrumental in the development of the sugar industry in the southern region of the island. The Chalet Amill was built in 1914 by architect Tomás Olivari Santoni for Ángel Antongiorgi Paoli. Antongiorgi Paoli gave the chalet to his daughter Ana Lucía as a wedding gift when she married Juan Amill Rodríguez. The couple soon divorced and by the mid-1920s the chalet was converted into a hotel, first as the Auristela Hotel and then as the Paris Hotel. This hotel was owned by the daughter of Francisco Bartolomei, Lola Bartolomei. The Bartolomei family were first generation Corsican immigrants who owned coffee plantations in this area. The Mansión Negroni (Negroni Mansion), also known as Casa Agostini (Agostini House), was built around 1850 by Antonio Francisco Negroni Mattei. Later it passed to the Agostini family through the marriage of María Victoria Negroni, daughter of Antonio Francisco, and Ignacio Agostini Felipi. The Agostini family made their fortune in the exportation of coffee. They were the owners of "Sobrinos de Agostini y Compañía" (Nephews of Agostini & Co.). Ángel Pedro Agostini Natali, a member of the family, is credited with inventing the coffee grinder. This machine revolutionized the coffee industry. As a consequence, the island was able to meet the huge demand for Puerto Rican coffee which resulted in the "Golden Age" of Yauco's economy. This house was acquired by the Holy Rosary School in Yauco and a bronze plaque describes its history. The Residencia Lluberas Negroni, erroneously called the Residencia González Vivaldi (González Vivaldi Residence), was built in 1880 by Arturo Lluberas for his wife Asunción Negroni. Most recently, it was acquired by the González Vivaldi family. Besides having distinguished careers in agriculture and the military, Puerto Ricans of Corsican descent have made many other contributions to the Puerto Rican way of life. Their contributions can be found in, but are not limited to, the fields of education, commerce, politics and entertainment. The Vivoni family has four notable members: Carlos Vivoni, the former Secretary of Economic Development and Commerce and, as well, former Secretary of Housing, Pedro Santos Vivoni, the first mayor of Lajas, Pierre Vivoni, a Judge and former Police Commissioner, and José Antonio Vivoni Ramírez de Arellano, the former mayor of San Germán. Other Puerto Ricans of Corsican descent who have led notable political careers were Ernesto Ramos Antonini, who was the first President of the House of Representatives of Puerto Rico and co-founder of the Partido Popular Democrático de Puerto Rico (Popular Democratic Party of Puerto Rico), Jaime Fuster Berlingeri, an associate justice of the Puerto Rico Supreme Court and former Resident Commissioner, Jorge Farinacci, the head of the Puerto Rican Socialist Party, and Jorge Santini, the former mayor of San Juan. One of the first Puerto Rican entertainers to achieve world-wide fame was Antonio Paoli Marcano, an opera singer known as "The King of Tenors" and as "The Tenor of Kings." He was the first operatic artist to record an entire opera when he participated in a performance of Pagliacci by Ruggiero Leoncavallo in Italy in 1907. The Palmieri brothers, Charlie and Eddie Palmieri, were band leaders in the United States. Rock N Roll Hall of Famer Joe Negroni was a member of the rock and roll group The Teenagers. Both Américo Boschetti and Vicente Carattini were singers and composers. Carattini composed Puerto Rican Christmas-related songs. Carmen Delia Dipiní was also a notable singer of boleros. The following is a list of some of the surnames of the first Corsican families who immigrated to the Adjuntas, Yauco, Guayanilla, and Guánica areas of Puerto Rico in the 19th Century. This list was compiled by genealogist and historian Colonel (USAF Ret.) Héctor A. Negroni who has done exhaustive research on the Corsican migration and origins of his Negroni family name. Adriani, Agostini, Altieri, Anciani, Angilucci, Annoni, Anpani, Antongiorgi, Antoni, Antonini, Antonmarchi, Antonmattei, Antonsanti, Arenas, Artigau, Barbari, Bartoli, Bartolomei, Battistini, Benedetti, Belgodere, Bettolacce, Benvenutti, Berlingeri, Bernardini, Biaggi, Blasini, Boagna, Boccheciamp, Bocagnani, Bonelli, Bonini, Bracetti, Cardi, Carraffa, Casablanca, Casanova, Catinchi, Cervoni, Cesari, Chiavramonti, Cianchini, Costa, Damiani, Dastas, Defendini, Deodati, Dominicci, Emmanuelli, Estella, Fabbiani, Farinacci, Feliberti, Felippi, Ficaya, Figarella, Filipini, Franceschi, Franceshini, Franzuni, Fratacci, Fraticelli, Galletti, Garrosi, Gentili, Gilormini, Giovanetti, Giraldi, Giuseppi, Giuliani, Gordi, Graziani, Grillasca, Grimaldi, Guidiccelli, Lacroix, Lagomarsini, Laveri, Lazarini, Leandri, Linarola, Lipureli, Lorenzi, Lucca, Luchessi, Lucchetti, Luiggi, Maestracci, Malatesta, Marcantoni, Marcucci, Mari, Mariani, Marietti, Marini, Massari, Massei, Masini, Mattei, Maxinie, Micheli, Miguinini, Mignucci, Minucci, Modesti, Molinari, Molinelli, Molini, Montaggioni, Moravani, Mori, Muratti, Natali, Navaroli, Negroni, Nicolai, Nigaglioni, Octaviani, Olivieri, Orsini, Padovani, Paganacci, Palmieri, Paoli, Pelliccia, Pellicer, Piacentini, Piazza, Pieraldi, Piereschi, Pieretti, Pierantoni, Pietrantoni, Pietri, Piovanetti, Poggi, Polidori, Quilinchini, Rafaelli, Rafucci, Rapale, Rencini, Renesi, Romanacce, Romani, Rubiani, Rutali, Safini, Saladini, Sallaveri, Santini, Santoni, Santuchi, Savelli, Semidei, Senati, Shyny, Sinigaglia, Silvagnoli, Silvestrini, Simonetti, Sisco, Sonsonetti, Tollinchi, Tomasi, Tossi, Totti, Vecchini, Vicchioli, Vallevigne, Vicenti, Vincenti, Vincenty, Villanueva, Vivaldi and Vivoni. ^ "Chronology | Expocorsica". expocorsica.com. Retrieved 2015-11-21. ^ Vivos los colores del Rey del Pincel. Reinaldo Millán. La Perla del Sur. Ponce, Puerto Rico. August 3, 2011. Retrieved August 3, 2011. Note: This is the new address number of the location based on recent US Postal Service renumbering of lots in that area. The old #14 is still widely in use. ^ a b Juan Llanes Santos (August 11, 2009). "National Register of Historic Places Registration: Casa Paoli" (PDF). National Park Service. Retrieved December 4, 2009. (19 pages, with maps and b&w historic photos and 5 recent color photos). Registration Form #2280 (NRHP# 09000769). Page 5. ^ "JUSTIPRECIACIÓN DE LA OBRA DE FRANCISCO ROJAS TOLLINCHI"; by Ada Hilda Martínez de Alicea; Dept. Estudios Hispánicos Pontificia Universidad Católica de PR. ^ Un Hombre para la Historia: Ernesto Ramos Antonini, Galeria de Fotos 1, Anuario Ponce High. Ernesto Morales Ramos. 2005. Retrieved December 20, 2011.